Even as corporate venture capital (CVC) has come into its own as a powerful open innovation tool, the single biggest limitation facing CVC managers has been an objective set of metrics to allow them to systematically define and articulate strategic value. Without structure and definition there can be no discipline or measurement. And without discipline and measurement, a CVC program risks being marginalized as lightweight and insubstantial rainbow-chasing. The TiCR Innovation Analytics™ platform transforms CVC from a subjective practice to a quantitative, scalable, empirically-driven business process. Entering investment options into TiCR can take less than a minute. This allows managers to gather intelligence on many more investments, creating a meaningful pattern of ecosystem intelligence both immediately, and for the future. This allows CVC managers to identify external investment trends – including potential disruptions – integrate them into broader enterprise innovation investment decisions. 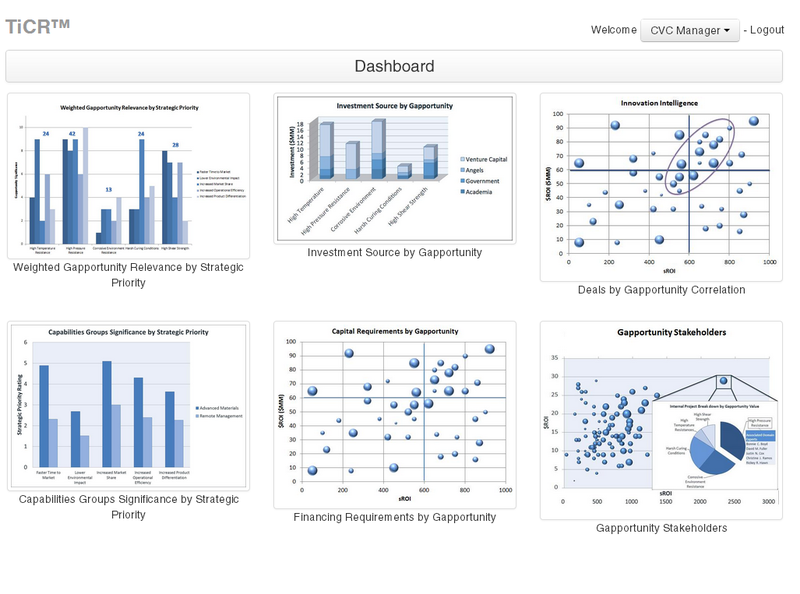 TiCR’s powerful visualization tools chart the relationships between enterprise innovation needs, existing capabilities, and external innovation ecosystem activity. This allows TiCR users to communicate meaningful patterns easily and compellingly to internal stakeholders such as business unit leaders, key innovation managers, and C-level sponsors. In addition, TiCR’s powerful analytical tools allow the firm’s internal innovation topography to be analyzed to discover gaps, strengths, and partnering assets. TiCR creates an institutional memory of a firm’s strategic priorities, innovation needs, and innovation investment options, creating a powerful institutional memory of all facets of the innovation equation. This supports predictive modeling, longitudinal comparison, performance-tracking, and similar portfolio management functions.